Russian State propaganda is endangering the lives of aid workers by portraying their convoys as “Trojan horses” for Syria’s insurgents. 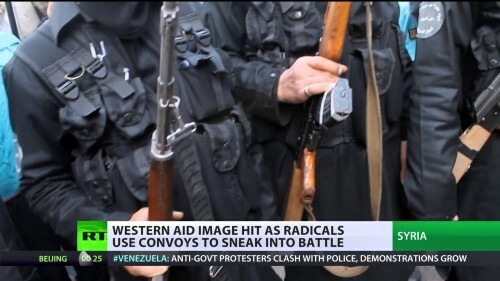 The item does not show any opposition fighters in aid vehicles. Instead, it resorts to generic footage of men in balaclavas, carrying automatic weapons as they walk through a forest. Gunmen have fired on aid convoys in recent months as they tried to move into the Yarmouk section of Damascus and into the Old City of Homs, wounding an ambulance driver. Aid workers have long warned that they become targets when their work is conflated with military or paramilitary operations, as in the case of Afghanistan.